Wgrib2 was designed to be parallelized by what-may-be-called dataflow programming. Data flows into a black box and data flows out. One way to parallelize is to divide the data flow into N streams, process each stream separately and then recombine the streams at the end of the processing. For example, some wgrib2 operations can be doubled in processing speed if you run two copies of wgrib2 and let one copy process the even grib messages (records) and the other process the odd messages. The grib output of the two copies need to be recombined by a merging program. Wgrib2ms and wgrib2mv are perl scripts that allow you parallelize your wgrib2 commands in a similar fashion. The difference between wgrib2ms and wgrib2mv is that wgrib2mv is designed for grid interpolation where you have to the vector components of a field in the same grib message. *    and the U-component must be followed by the V-component. *       you can change the above line to ex. vectors="UGRD:VGRD:UFLX:VFLX:USTM:VSTM"
of the results of the 4 streams is done at the same time as the wgrib2 processing. For wgrib2mv, each grib message contains either a vector or scalar field. For examples of vector fields would be the wind (UGRD, VGRD) or the storm tracks (USTM, VSTM). Examples of scalars would be the temperature (TMP) or relative humidity (RH). For wgrib2ms (s is for scalar), every field is treated as a scalar. The output from wgrib2mv has the vector quantities packed together and wgrib2ms has the vector fields in separate grib messages. In theory, wgrib2ms should be faster than wgrib2mv because the pipelines are shorter and each grib message is more uniform in size. However, if you need to do a -new_grid, you have no choice but to use wgrib2mv. 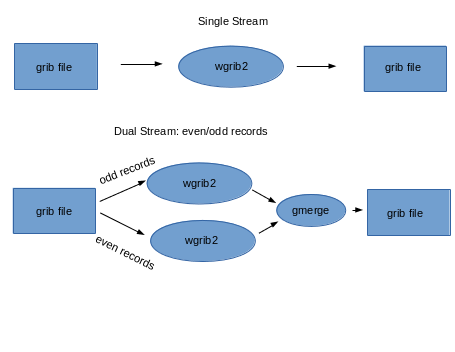 Wgrib2m parallelizes a wgrib2 command by dividing the data flow into N streams which are processed independently. Only a limited number of output options are supported. Note that the inventory from wgrib2m is in a different order than the inventory from a wgrib2 command. For -new_grid to work, you have to use wgrib2mv. In addition, the input file must have UGRD and VGRD (default) in the same grib message. Both wgrib2 and wgrib2mv support arbitary vector pairs using the -new_grid_vectors option (v2.0.2). Note that wgrib2mv follows the copygb convention and only UGRD and VGRD are interpolated using vector interpolation by default. If you want to process the grib data as scalars and convert the output file so that (UGRD, VGRD) are in the same grib message, you can do something like this. Each output option must write to the output file for every record processed. A major use of wgrib2mv is to regrid a file. Suppose we only want to do a vector interpolation of (UGRD,VGRD) and (UGRD,VGRD) and only (UGRD,VGRD) are already stored in the same grib message. In addition suppose we want to interpolate to ncep grid 221. THen the 1 stream version is. wgrib2mv run M(ultiple streams) using V(ector in own grib message). Jpeg2000 packing is known for good compression as the expense of speed. Suppose you have downloaded some jpeg2000 copressed files and want to work with them. You speed up your processing by converting the files from jpeg2000 in parallel. an 8 core machine, the command will be quite quick. Making a cookie cutter subset of file can be done in parallel. may be realized if gmerge were properly threaded.